Hey y'all, I’m Heather Beal. I'm a certified Dunham Technique instructor, dancer, choreographer and actress. Hire me. Heather Beal (Founder and Artistic Director) hails from East Saint Louis, IL and received her BA in Dance from Columbia College Chicago. She is a certified Dunham Technique teacher and grew up dancing with the Katherine Dunham Museum Children's Workshop. Heather was the last person to perform an original choreography by Katherine Dunham for Katherine Dunham. 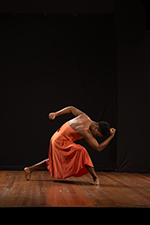 Heather has performed and choreographed many shows at The Black Rep in ST. Louis, MO and currently performs as a principle dancer with Innervision Dance Theatre, under the direction of Keith Tyrone Williams.